With Christmas not far away now it is time to focus on my seasonal digitising. I love to take time to create something very special and unique each year and this year there are 2 collections being developed! 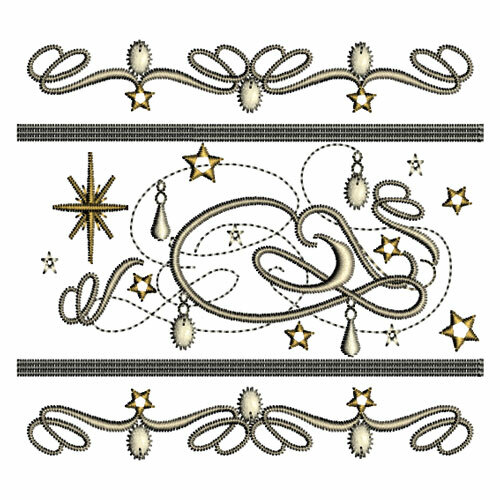 The first one consists of some Elegant Christmas Messages embroidered in an olde English Text font with a scroll and swirl background and small delicate stars and tiny baubles. 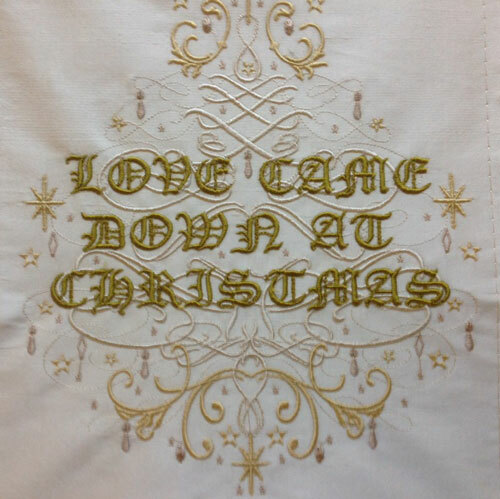 It is essential that the first colours are stitched in the same colour or just a shade darker than your fabric giving it a decorated look that allows the letters of your message to stand out! I have carefully selected the colours for this collection, using Sulky Rayon 40 wt 1071 Off white, 1022 Cream and 1127 Medium ecru as my embroidery was stitched on cream silk dupion, my favourite fabric. 1070 Gold was used for the scroll work which sits above and below the messages. 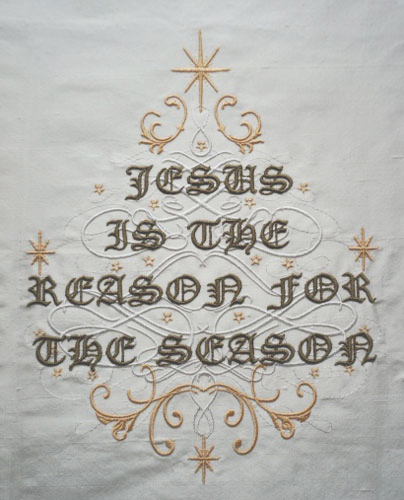 The message below was embroidered in 1227 Green gold. There are quite a few messages within the collection with 2 types of backgrounds. You will need a large hoop, 300mm (12″) by 200mm (8″) hoop to stitch them out. For the design below I used a darker green so the letters stand out more. I confess that these designs were created last year but failed to be ready in time for Christmas 2013 and were put on the back burner for a while. I had tried many times to create smaller designs to compliment them but failed to produce anything that looked good. However this year I have been a little more successful and at the moment a set for 4″ x 4″ and 5″ x 7″ hoops are being developed and should be released around December 2nd, 2014. The large main designs will be perfect for seasonal cushions, pictures, wall hangings and tree skirts. Your guests will be delighted to see such welcoming messages when they visit. The smaller designs, featuring small motifs, borders and corners, can be used on table cloths, napkins, quilts and for combining in projects that use the main designs in this collection. I have changed the little stars and baubles several times so they make the designs pop. Compare the designs below with the ones above to see the difference. The main set will be released on Saturday 29th November and the other sets will follow a week or so after that. Check my website for a special Black Friday event! 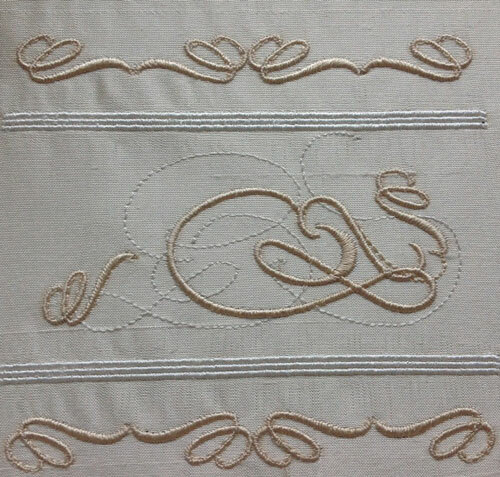 Here you can see the first colours stitched out on the border design showing the swirls and scrolls stitched in off white and cream on cream silk. I can see this design on a napkin ring! 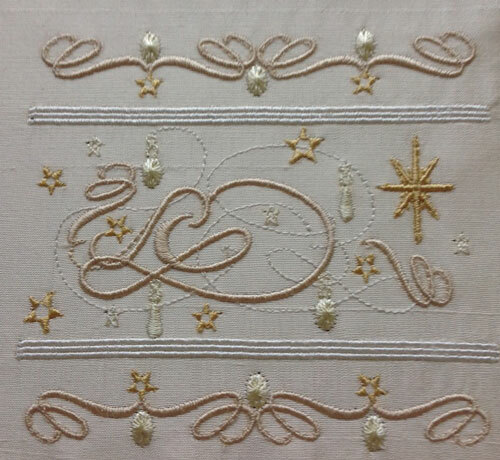 Here you see the completed design with gold stars, and little decorations in cream. I hope you like them. In the large message designs the little decorations are added around each message but the scrolls remain the same. Here are a selection of designs for 4″ by 4″ hoops that will compliment your large messages. 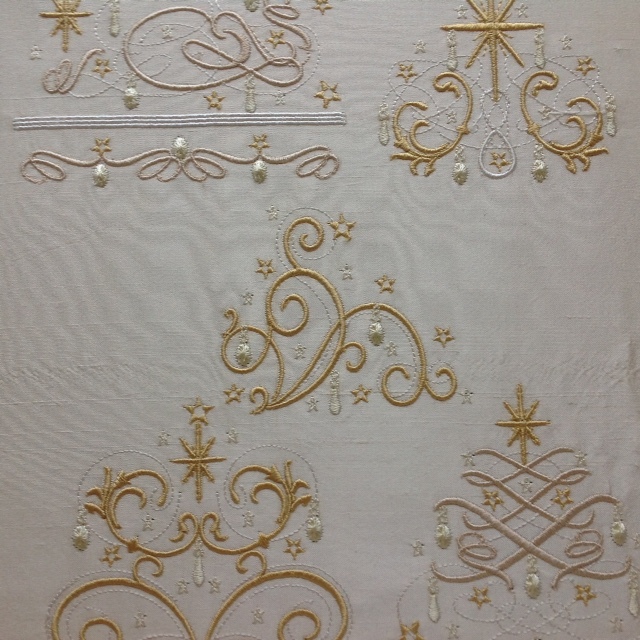 Naturally a few extra embellishments, like crystals and beads will give extra sparkle and bling to your embroidery catching the lights from the Christmas tree. This entry was posted in Announcements, New Designs and tagged Christmas, Crystals, The importance of colour. Bookmark the permalink.